This article describes the verification of steel members subject to shear, bending moments and axial forces. The member must provide adequate compression, tension, bending and shear resistance. Where the member is subjected to axial and lateral loading simultaneously, additional resistance requirements checks will be required, taking into account the combination of these loading effects. Combined axial loading and bending, where applicable. SCI P362 forms the background to the member design presented in this article and provides more comprehensive guidance. The values are those given in the UK National Annex to BS-EN 1993-1-1. Class 1 cross-sections are those which can form a plastic hinge with the rotation capacity required for plastic analysis without reduction of the resistance. Class 2 cross-sections are those which can develop their plastic moment resistance, but which have limited rotation capacity because of local buckling. Class 3 cross-sections are those in which the stress in the extreme compression fibre of the steel member assuming an elastic distribution of stresses can reach the yield strength, but local buckling prevents development of the plastic moment resistance. Class 4 cross-sections are those in which local buckling will occur before the attainment of yield stress in one or more parts of the cross-section. The class of the cross section is determined from Table 5.2 of BS EN 1993-1-1 , where a cross section is classified according to the highest (least favourable) class of its compression parts. See also SCI P362 . Section classification is also given in resistance tables, such as SCI P363 (the 'Blue Book' ). SCI P363 gives axial load ratios where (under increasing levels of axial load) a section becomes Class 3 and Class 4. The level of axial load at which a section becomes Class 2 is not required because the same section properties (the gross area and plastic modulus) are used in the resistance calculations for both Class 1 and Class 2 sections. Class 4 cross sections are not considered in this article. 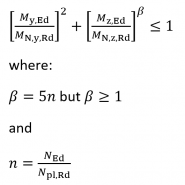 NRd, My,Rd and Mz,Rd are the design values of the resistance depending on the cross-sectional classification and including any reduction that might be caused by shear effects. More generally, the Eurocodes provide specific clauses for common combined effects (for example bending and shear, bending and axial force and bending, shear and axial force) which should be used in preference to this simplified approach. According to the UK National Annex to BS-EN 1993-1-1, yield strength fy and ultimate strength fu must be taken from the product standard, not Table 3.1 of the design standard. Moreover, if a range of ultimate strengths is given in the product standard, the lowest value must be adopted. Yield strengths and ultimate strengths for hot-rolled steelwork are given in BS EN 10025-2. The properties of the gross cross-section should be determined using the nominal dimensions. Holes for fasteners need not be deducted, but allowance should be made for larger openings. Splice materials should not be included. The net area of a cross section should be taken as its gross area less appropriate deductions for all holes and other openings. For calculating net section properties, the deduction for a single fastener hole should be the gross cross-sectional area of the hole in the plane of its axis. For countersunk holes, appropriate allowance should be made for the countersunk portion. For angles connected through one leg, refer to BS EN 1993-1-8 Clause 3.10.3. Similar consideration should also be given to other types of sections connected through outstands. Section classification is given in resistance tables, such as SCI P363 (the 'Blue Book'). For members of uniform cross-sections in axial compression the design buckling resistance, Nb,Rd almost always governs. Wel,min corresponds to the fibre with the maximum elastic stress. For bending about both axes, the following criterion may be used for I and H sections. Beams subject to loads which do not act through the point on the cross-section known as the shear centre normally suffer some twisting. For doubly symmetrical sections such as UB or UC, the shear centre coincides with the centroid, while for channels it is situated on the opposite side of the web from the centroid. If torsion cannot be avoided, a torsionally stiff section, such as a hollow section, should be used. The twist of an open section may be very significant and must be considered if this type of section is used. More information on torsional resistance is given in SCI P385. Vc,Rd is the design plastic shear resistance Vpl,Rd. Av is the shear area. The shear resistance may be limited by shear buckling. For such situations, reference is to be made to BS EN 1993-1-5. Shear buckling is rarely a consideration with hot rolled sections. Where shear is present, allowance should be made for its effect on the bending resistance. 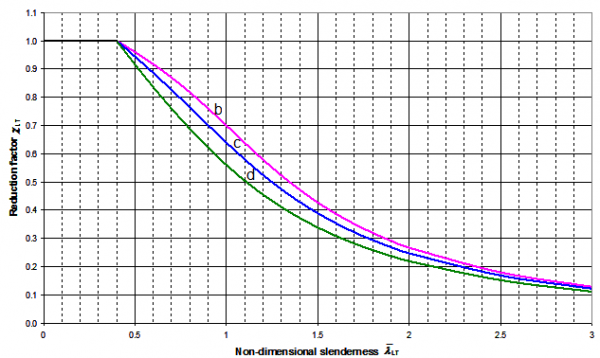 Where VEd < 0.5Vpl,Rd the effect of the shear force on the bending resistance may be neglected, except where shear buckling reduces the section resistance. and Vpl,Rd is calculated as described here. MN,Rd is the design plastic moment resistance reduced due to the axial force NEd. 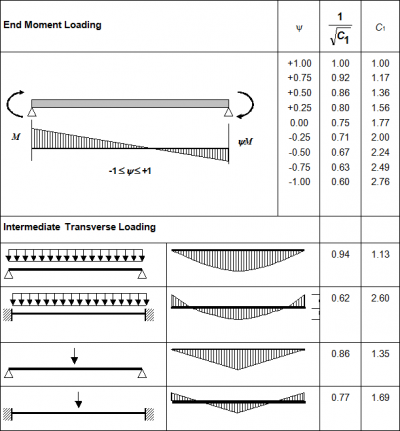 For Class 3 cross-sections the maximum longitudinal stress due to moment and axial force, taking account of fastener holes, where relevant, should not exceed fy/γM0. Where VEd ≤ 0.5Vpl,Rd, no reduction of the resistances defined for bending and axial force need be made. Where VEd > 0.5Vpl,Rd, the design resistance of the cross-section to combinations of moment and axial force should be calculated using a reduced yield strength, as given for bending and shear. Torsional-flexural buckling, which may be critical for asymmetric sections subject to axial compression. where α is an imperfection factor. where Ncr is the elastic critical force for the relevant buckling mode. For each mode of buckling, the value of Ncr is determined. Open sections (UB, UC) (bi-symmetric sections) are not subject to torsional flexural buckling. Open sections do exhibit torsional buckling, but for any given length, minor axis flexural buckling is critical. SCI P363 (the Blue Book) provides flexural buckling resistances in both axis and the torsional buckling resistance. For angles, an effective slenderness should be calculated from Annex BB.1.2 of BS EN 1993-1-1. A similar effective slenderness can be calculated for channels which are only connected through the web. See the Compression resistance design tool. The imperfection factor α corresponding to the appropriate buckling curve is obtained from the table below. The choice of buckling curve is obtained from the table to the right. The value of χ may be calculated, or may be obtained from a graph or a table. The graphical presentation is shown in the figure below, taken from SCI P362. Mb,Rd	is the design buckling resistance moment. Beams with sufficient restraint to the compression flange are not susceptible to lateral-torsional buckling. χLT	is the reduction factor for lateral-torsional buckling. See the Bending resistance design tool. The use of these values is endorsed by the UK National Annex. C1 is a factor that depends on the shape of the bending moment diagram - see figure on the right. Mcr may be determined using the software LTBeam. Alternatively, Mcr may be determined using the Elastic critical moment for lateral-torsional buckling (Mcr) calculation tool. Other (simplified) approaches are described in SCI P362 Section 6.3.2.3. The value of the imperfection parameter αLT corresponding to the appropriate buckling curve is given by the table below and the choice of buckling curve given in the subsequent table. The lateral torsional buckling curves for rolled sections are shown in the figure below, taken from SCI P362. Having calculated λLT and selected the appropriate curve, the reduction factor χLT may be calculated or determined from look-up tables in SCI P362, or by using the above figure. For members of structural systems, verification of buckling resistance of doubly symmetric cross-sections may be carried out on the basis of the individual single span members regarded as cut out of the system. Second order effects of the sway system (P-Δ effects) should be taken into account, either by the end moments of the member or by means of appropriate buckling lengths about each axis for the global buckling mode. kyy, kyz, kzy, kzz are interaction factors, which may be determined from Annex A or B of BS EN 1993-1-1. Annex B is recommended as the simpler approach for manual calculations. Use of either Annex is permitted by the UK National Annex. In some cases, a conservative value of the k factors may be sufficient for initial design. 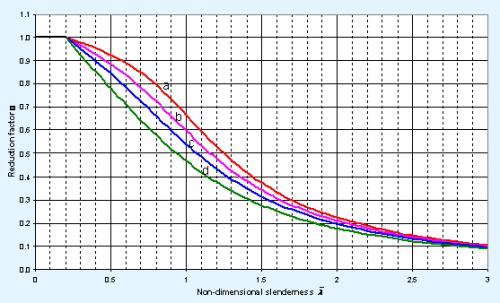 The following table gives maximum values, based on Annex B of the Standard, and assuming the sections are susceptible to torsional deformations, i.e. not hollow sections. The equations to calculate the interaction factors are given in SCI P362 Appendix D. A series of graphs are provided in SCI P362 from which accurate values of the interaction factors may be determined as an alternative to calculation. See the Combined axial compression and bending resistance design tool. Design of columns in simple construction is based on NCCI document SN048 in which a column in simple construction subject to nominal bending moments and axial compression may be verified using simplified interaction criteria. See the Columns in simple construction design tool. ↑ BS EN 10025-2:2004 Hot rolled products of structural steels. Technical delivery conditions for non-alloy structural steels, BSI. LTBeam is a software tool which deals with the elastic 'Lateral Torsional Buckling of Beams' under bending action about their major axis. SCI P385 Design of steel beams in torsion, 2011. NCCI: SN003b-EN-EU Elastic critical moment for lateral torsional buckling. NCCI: SN048b-EN-GB Verification of columns in simple construction - a simplified interaction criterion.